Benro MPB150T is the smaller of the two Multi Purpose L Brackets currently available in Benro's line of Multi Purpose Brackets. Although these brackets had been announced in Benro's catalogs about two years ago, it is only in the past year that they appeared on the shop selves. It is also a long time that I wanted to get one for test and review, but something else has been stealing the priority. 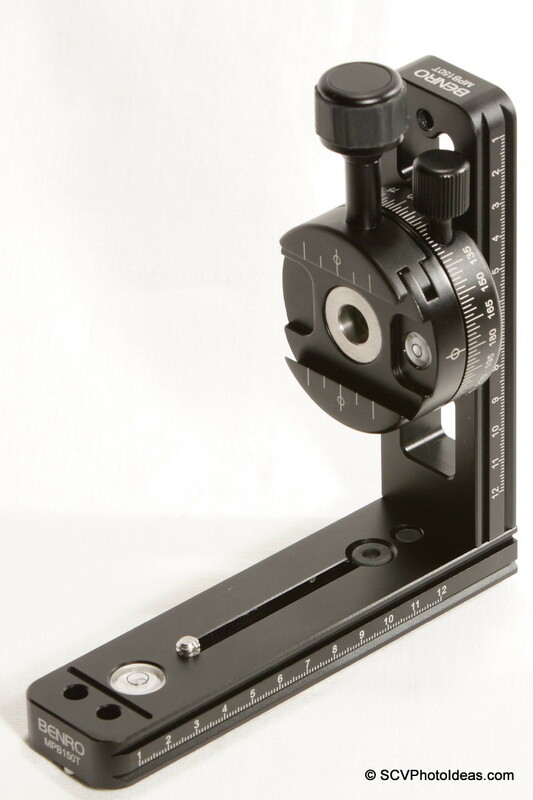 Finally I decided to get one together with a Benro MPB10 Multi Purpose Nodal Rail for testing, from my local supplier. My choice for the shorter/smaller bracket was based on the fact that it would better fit as an L bracket on a heavy camera apart from its other uses which we'll see further on. Multi Purpose Brackets specification courtesy of Benro web site. Its dimensions are 150 x 150 x 38 x 16 mm, which are Base-rail length, Total vertical height, Rail width and Rail thickness respectively. Total verified weight 305gr without the base screw. According to Benro, their brackets are CNC machined and treated to a corrosion-proof system to reduce wear and enhance appearance. And they are compatible to the Arca Swiss® quick release system and accessories. 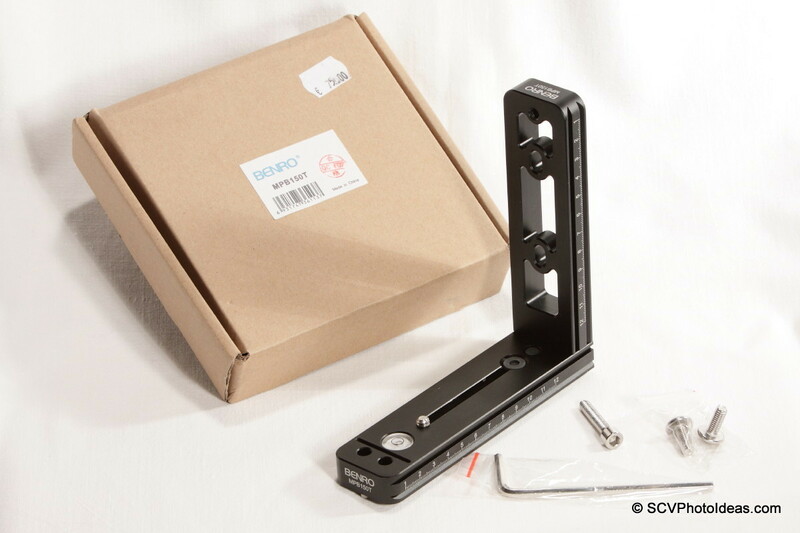 MPB150T L bracket comes boxed in a recycled carton box which has a small sticker with product number, bar-code and a red QC (Quality Check) stamp. The bracket is wrapped in a nylon bag with air bubbles, and is accompanied by small self-closing nylon bags containing one 35mm long shaft M6 hex socket bolt, two 15mm long shaft M6 screws and a 4mm Allen hex key suitable for the 1/4"-20 base captive screw and the two M6 screws. No user manual or hex keys for the other screws are included. First impression is of well made bracket of high quality machining, finishing and fitting. The base rail has a 63mm long captive slot occupied by an 1/4"-20 captive screw. A big spirit bubble level as well as two holes and a groove behind them. There are laser engraved metric scales along both sides. 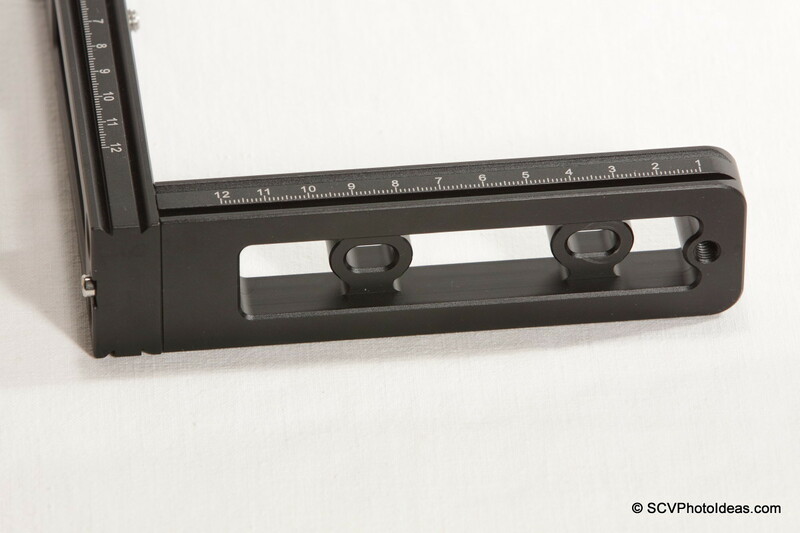 The scale has small marks every 1mm a longer mark every 5mm and numbered every 1cm from 1 - 12. Somehow, the good image is spoiled a bit by the thin layer of anodizing that is easy to scratch even with a badly finished screw as the one inserted in the base rail slot. (Is obvious if you enlarge the photo above). The base rail bottom view reveals the very sturdy but also heavy structure of the rail. There is only a large cavity for the captive slot and screw. We can also see that the two front holes are passing through the bottom and a small hole bellow the bubble level, which would be used to push out the bubble level in case it needs to be replaced. As on all Benro rails and brackets there are two M3 safety stop screws pre-installed one at each end. Last but most important are the two M6 hex socket head bolts that hold the vertical side rail on top of the base rail. The fitting is so perfect that the hole bracket behaves like a single unit. However, there is an issue with the M6 and M3 screws. They cannot be loosened under normal methods or a little more severe manipulation. That means, if you want to separate the two rails or remove the safety stop screws its impossible with even high quality Allen hex keys without damaging either the key or the rails. Although there is a 1/4"-20 thread at the front end of the captive slot, there is also a rubber tap at the back end of the slot which when opened reveals a larger opening. This is a Benro standard to all MPB rails and brackets in order to enable the insertion of a larger 3/8"-16 captive screw which is available as an option. The 1/4"-20 chromed-steel captive screw which is included in the package has a 14mm round head and can be tightened either by the included Allen hex key or by a large flat screwdriver or even a small coin. Somehow the thread finishing is not of the same standards with some captive screws, provided with Benro camera plates, I have used for a long time now. (See further down for more details). Detail of the front holes and groove intended for holding a flash bracket. (That is, if someone could unscrew the base bolts and separate the vertical bracket in order to use each rail alone). 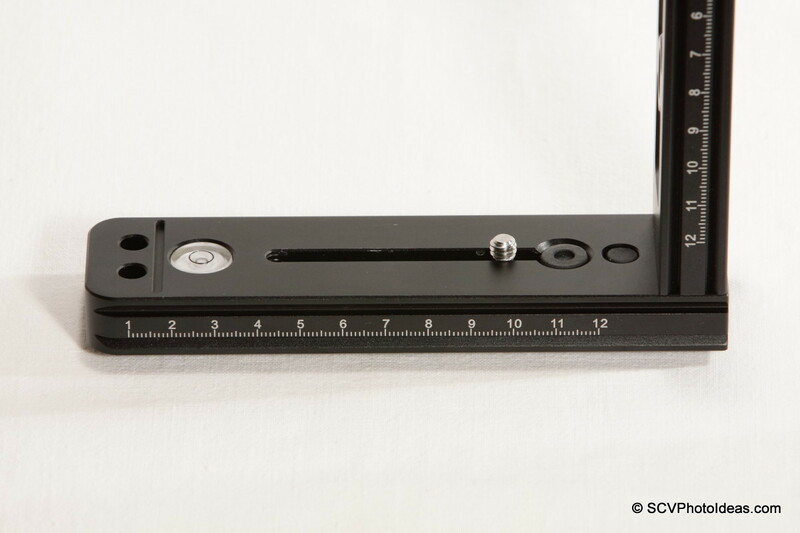 You can see also the big 15mm spirit bubble level, which with its white background is dominating the base rail. The vertical/side rail has carved out parts leaving only two braces with holes for the installation of Benro Panorama clamps. At the top there is an M6 threaded hole for the same purpose. 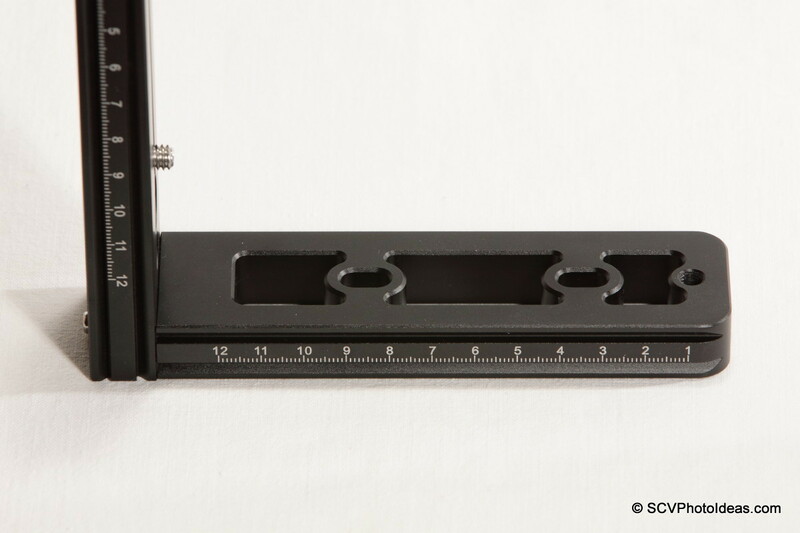 The laser engraved decimal scales found at both sides, follow the same pattern as on the base rail. The bottom or should I say outer view of the vertical/side rail reveals the same sturdy and quite heavy structure. There are no M3 safety stop screws on this rail. If you are going to use it as a Panorama head L bracket you'll never need them, but if you plan to use it as a camera L bracket you might miss them. Using MPB150T as a universal Camera L Bracket. As mentioned in the beginning, this was one of the main reasons I wanted to test MPB150T. 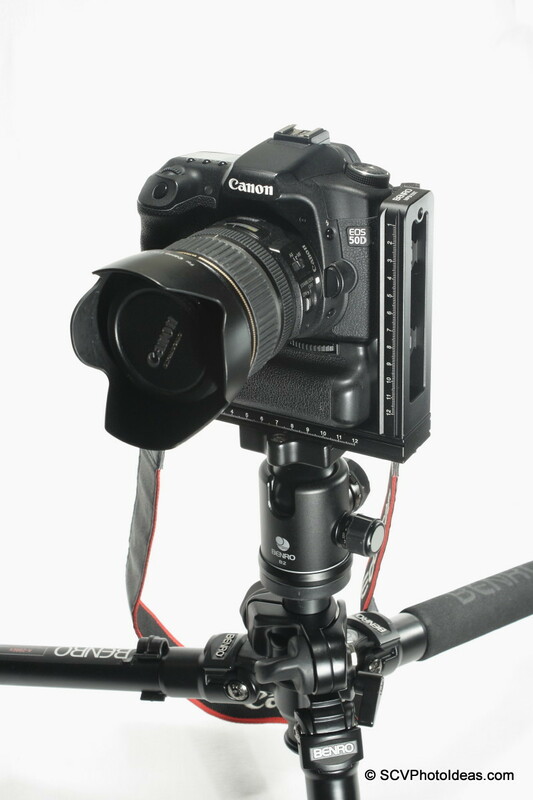 Its dimensions fit perfectly for a heavier gripped camera like the Canon 50D. Dedicated camera L brackets that fit perfectly to a camera body are nice to have, especially for landscape or architectural photography. But unless you use it most of the time for shooting in portrait orientation, I consider it a waste of money to buy one for each camera body you possess or will acquire in the future. For occasional use I prefer a universal L bracket that can fit all the camera bodies with or without a Battery Grip, easily removable saving me from carrying or holding the extra weight, whatever it is. ...or in the Portrait orientation, permitting ample adjustment and centering of the lens above the ball head pivoting point. In both cases the 15cm long rail permits ample bilateral shift for better composition without having to move the tripod. However, the very fine finished surface of the horizontal bracket has its drawbacks. There is not enough friction to hold the camera bottom steady and if a relatively heavy lens is attached then twisting is inevitable. Trying to tighten the 1/4"-20 captive screw more did not help at all, on the contrary caused much trouble. I exchanged the provided captive screw with one from my older Benro camera plates with better results but still it minimized the twist only a little. A solution would be to stick a piece of rubber tape on the base rail. As I did not have something appropriate at the time of this review, it remains to be tested sometime in the future. Taking this opportunity, please accept my advice. When you tighten a base plate screw, rotate it clockwise (screw in) until it stops. Then try to tighten up to 1/4 of a rotation maximum. 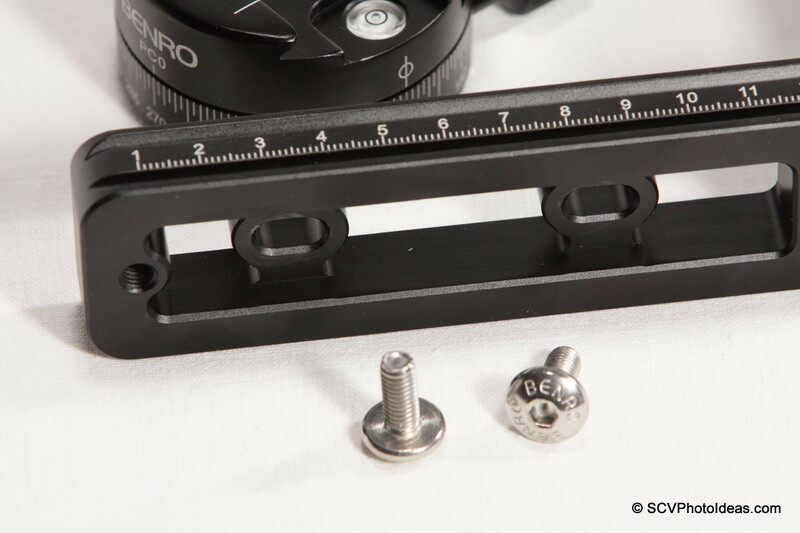 If a screw does not immobilize your camera base plate, bracket, or whatever, within that limit do not try to tighten more. Otherwise, you may end up with a damaged camera tripod socket. As these are usually made from chromed brass it is very easy to damage the threads. Mounting a quick release clamp on the horizontal rail is easy and offers some more benefits. 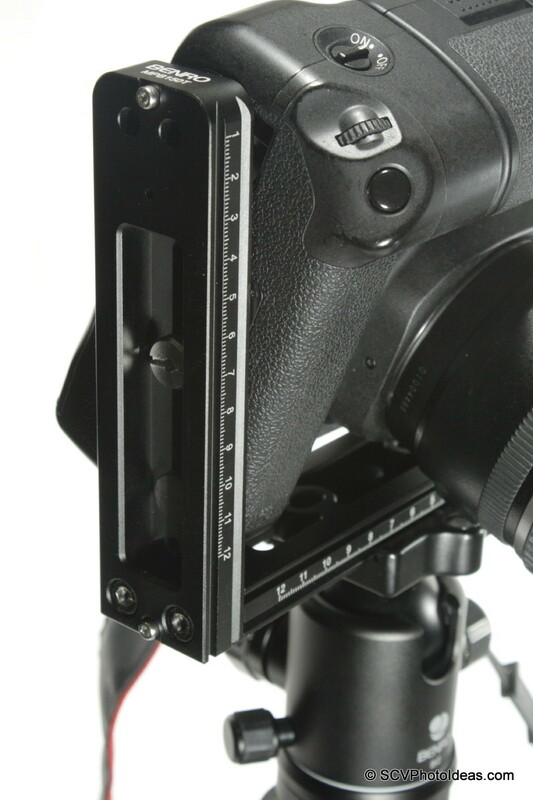 The universal L bracket can be quickly and easily mounted on, or dismounted from any camera equipped with an Arca Swiss® compatible base plate. 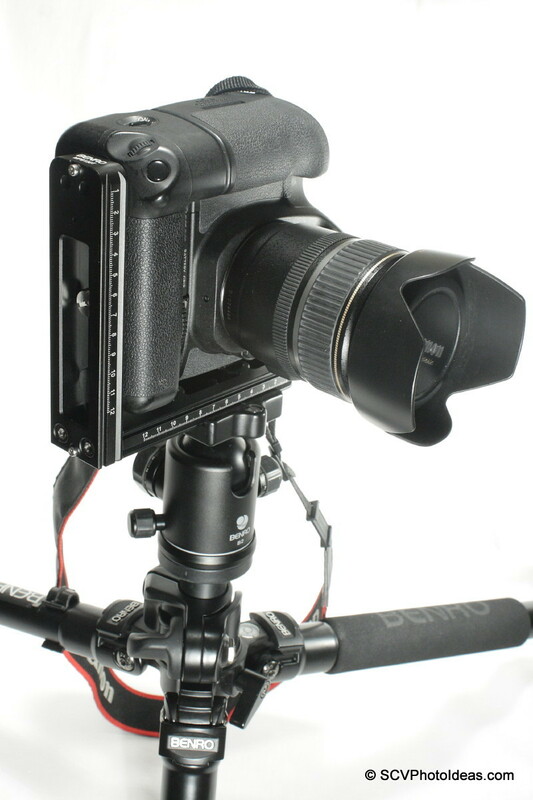 Then the bracket can be easily regulated on the camera leaving the desirable distance from the side of the camera, either exposing or covering the camera side connectors. Any QR clamp with a threaded center hole either 3/8"-16 with a reducing bushing or 1/4"-20, will do the job. 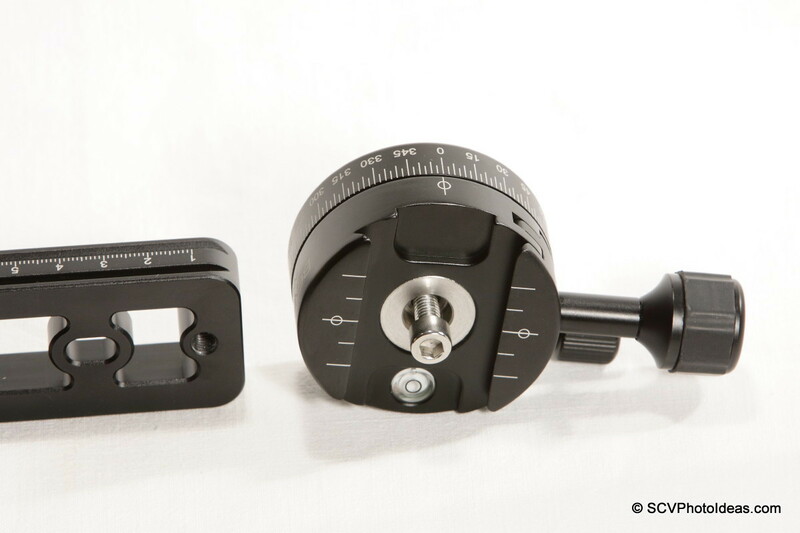 My choice this time was the Sunwayfoto DDC-42LR quick release clamp, due to its compact size and unobtrusive Lever release which will not interfere with the knobs of other clamps when the bracket will be installed on top of them. 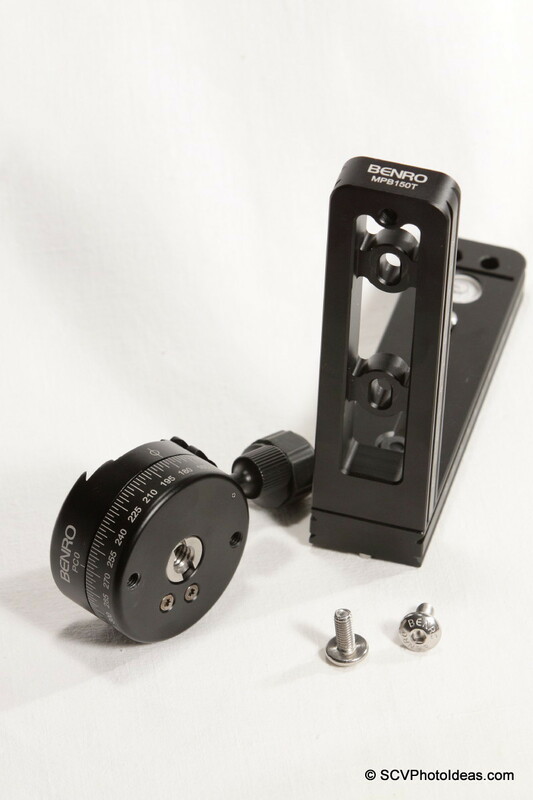 Benro does have Lever release clamps but unfortunately they don't have a threaded center hole. 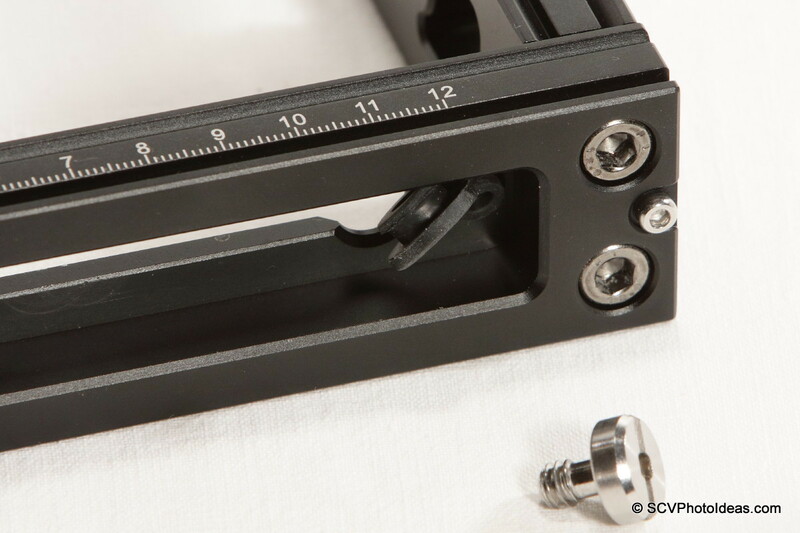 DDC-42LR Clamp aligned and tightened in the middle of the base rail via the existing captive screw. When tightened well the friction between the metal parts does not permit any twisting. In this case my backup camera, an old entry level Canon EOS 400D + BG-E3 grip was used for demonstration. The 2cm elevation offered by the camera plate and the extra clamp match well enough with the smaller camera body. The back view shows exactly what I meant by the extra clamp not interfering with the ball head clamp screw knob. If I used a screw knob clamp it should be oriented with the knob facing the front. In portrait orientation the addition of the extra clamp makes it very easy to move the side rail away from the camera side in order to use the camera connectors for a remote release cable or a USB cable for tethered shooting. There are two optional positions for attaching a Benro PC-0 or PC-1 Panorama Clamp on the MPB150T L bracket. Either at the top of the vertical rail or in the middle. For both positions the appropriate holes and screws are provided. a. Positioned at the Top. Positioning the Panorama clamp at the top of the vertical rail seems the most logical act, as it permits more freedom of movement. A small to medium sized camera body with a short lens may be turned all the way up, for shooting a Zenith point. ...and screwed in the top M6 threaded hole of the side rail. 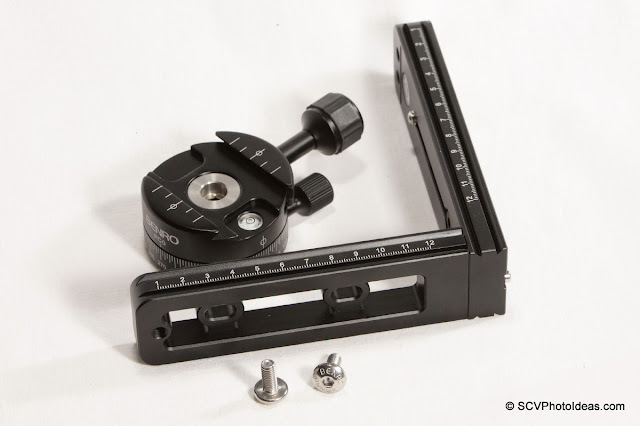 The Allen key required for the bolt is not provided with the Bracket, but it is part of the Panorama clamp's accessories/tools. The bolt should not be tightened fully yet. Next step is to use one of the provided M6 screws in order to align and secure the Panorama Clamp by one of its M6 threaded holes at the bottom (or better back side in this case). 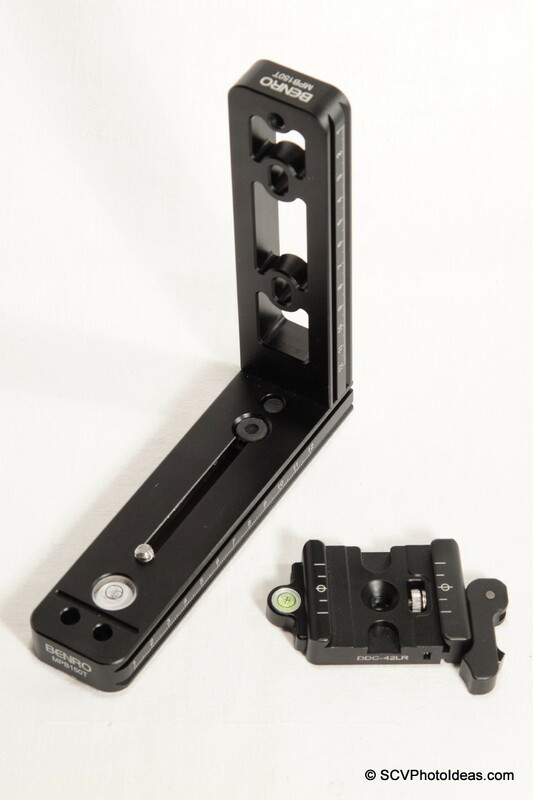 After the Panorama Clamp is aligned and both bolt in front and screw at the back are tightened fully, you have a nice multi row panorama L bracket. b. Positioned in the Middle. Although there is no accompanying literature explaining the purpose of a mid placement of a Panoramic clamp, I can imagine that Benro designers have provided a lower mounting position for better stability when someone does not need to shoot a full 360 degree spherical panorama. As in the case of a very wide or fish-eye lens, where a zenith or a nadir shot are not needed. 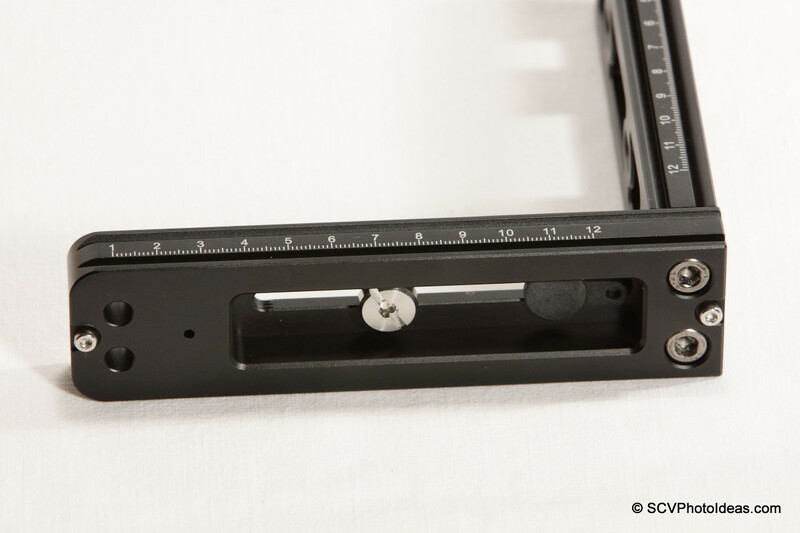 For this positioning, you need the two M6 screws provided with the bracket, in order to fix the clamp on the two braces of the side rail, by the M6 threaded holes on its back. The screw openings have an oval shape, in order to be able to accommodate both Benro PC-0 and PC-1 Panorama clamps, that their bottom holes have different distances. 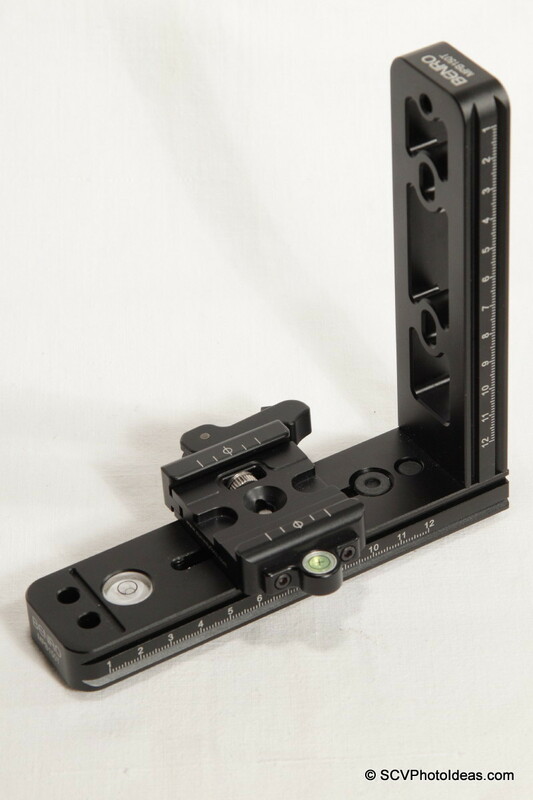 Passing the M6 screws through the brace holes and using the Allen hex key supplied with the Bracket, the Panorama clamp can be aligned and secured in place. 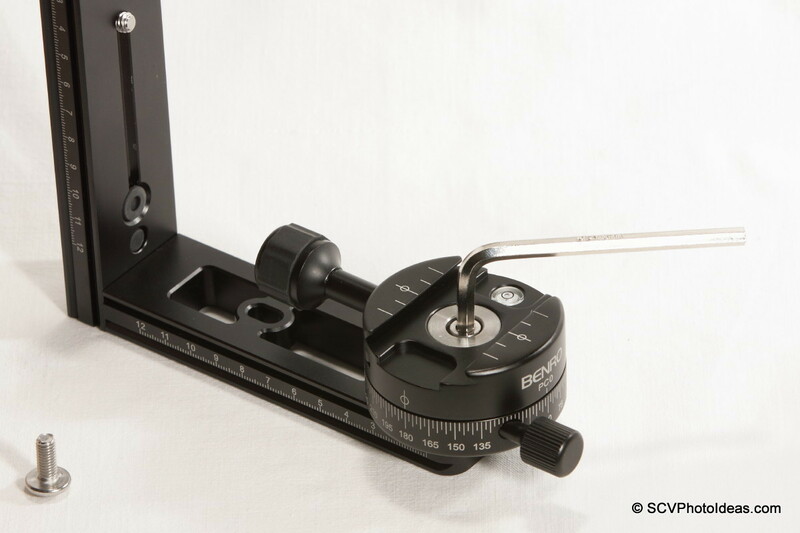 In this case both Panorama Clamp's knobs have to be oriented facing upwards as there is not enough space between the clamp and the base rail. Sturdy construction and stable within the load limits designated by the manufacturer. Very difficult to impossible to unscrew the M6 hex screws holding the vertical rail as well as the M3 safety stop screws. 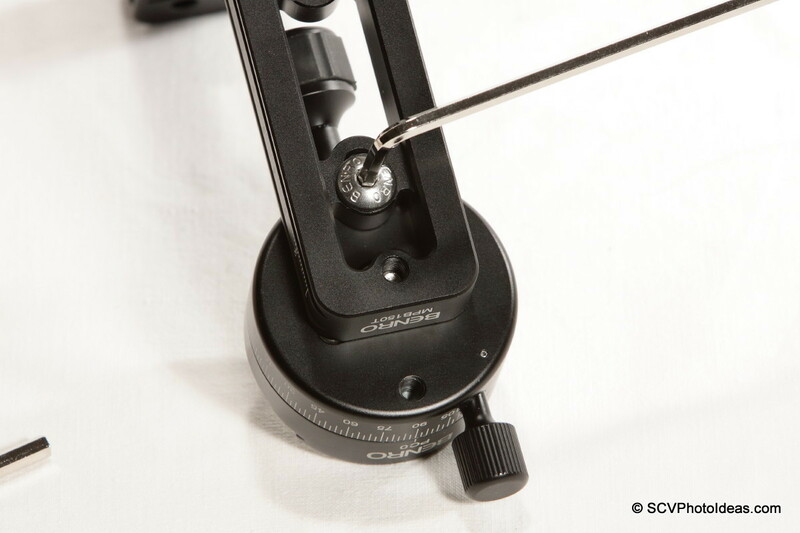 Care should be taken with the supplied 1/4"-20 mounting screw, as it may damage your camera tripod socket threads. 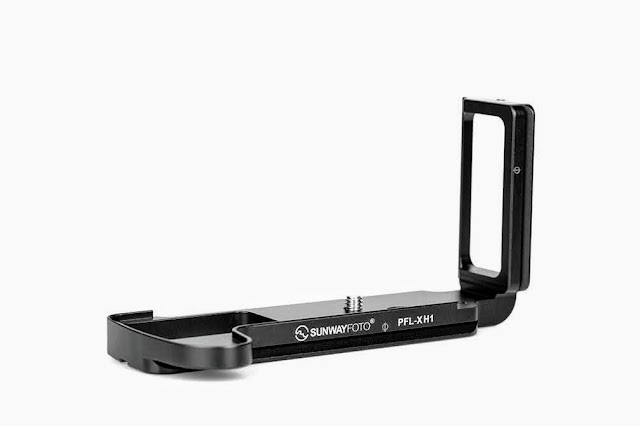 Bracket surface is slippery for mounting on a camera directly as an L Bracket, very prone to twisting. Thin coat anodizing which scratches off by screws easily. 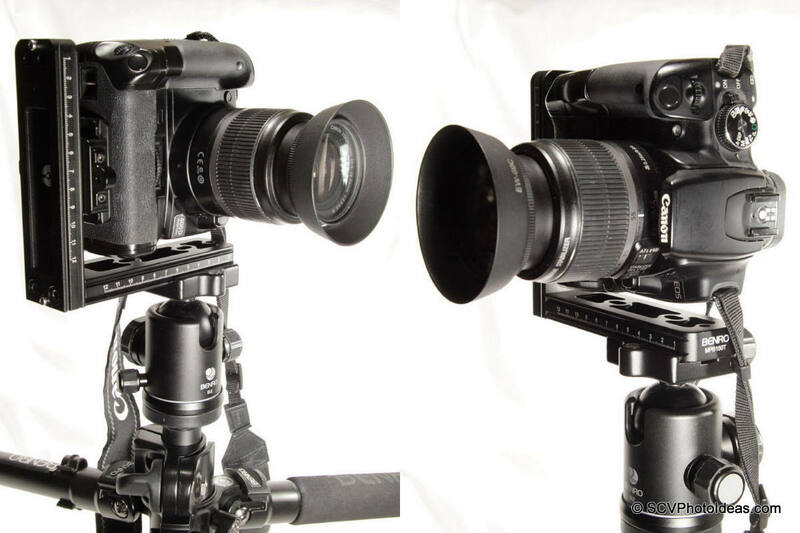 Comparing Benro MPB150T L bracket to the Giottos MH-680 VR Sliding Plate that I had reviewed in the past, seems to me something like comparing night and day. Benro's bracket makes Giottos' look like a toy, but on the other hand is far more heavy. I would be much happier with the bracket if the vertical rail retaining screws or the M3 safety screws could be easily removed. I do not understand the reason why, someone at Benro thinks that soaking the screws in "Loctite" (or whatever compound they use) before screwing them, is good. And it seems that this happens with all screws after a point in 2011, as it is a reported problem also with ball head clamp screws. 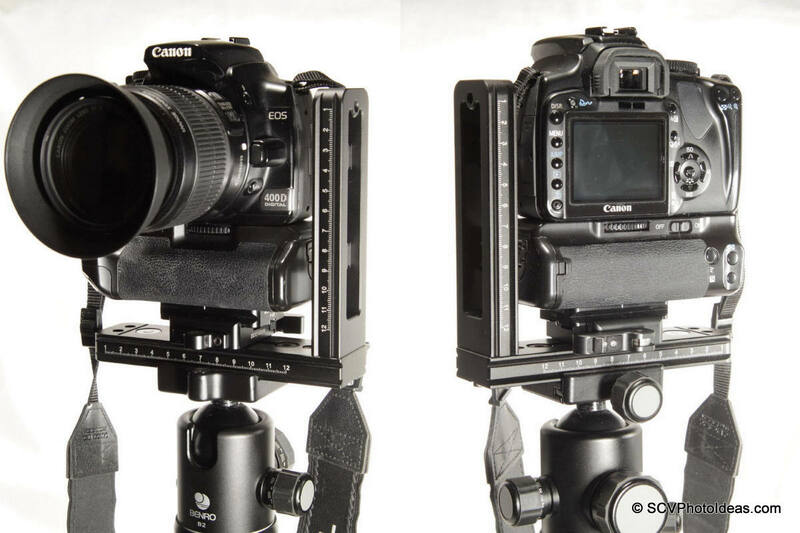 (See the Comments in Benro PC-0 and PC-1 Panorama Clamps Review for more info). However, it is a very sturdy bracket and despite the inconveniences, I would recommend it as a camera L bracket but with the addition of a QR clamp. 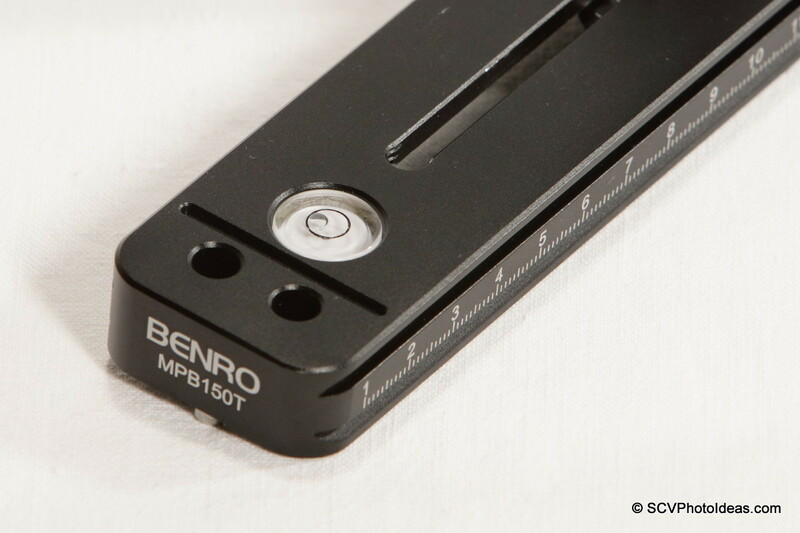 Indicative price of the Benro MPB150T L bracket is US$ 100.00 ~90.00 Shipped from eBay worldwide. Hello, Sotiris. Thank you very much for your great articles, they are like BBC documentaries for a newcomer like me, the only thing I could miss is some post about how you use the gear you describe with so much detail (but as I say your blog is great anyway). I have a doubt about de rubber tape you mention when you talk about the lack of friction between the braket and the camera bottom: I've bought a Sunwayfoto DDH-02 compact Panning Clamp wich I mount on the horizontal rail of the Benro MPB150T, and although it does not twist when it's well tightened to the rail, it can loosen sometimes, might be, I think, becouse temperature changes between the moment I mount it, at home for example, and the moment I take the pictures on the outside (it always has happened before mounting the camera, fortunately). To attach the clamp I use a 1/4"-20 ~ 3/8"16 thread conversion bushing and the 1/4"-20 chromed-steel captive screw which is included with the Benro MPB150T. 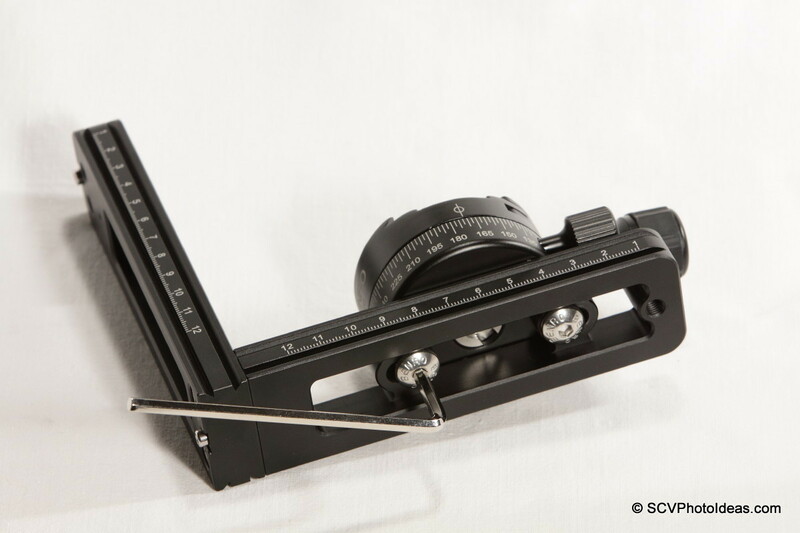 Do you think my problem could be fixed sticking a piece of rubber tape on the rail, or on the base of the panning clamp? Which kind of tape? I'm afraid to use an inadequate product and leave it worse than it was. Hello Fernando, thank you for your kind comments. 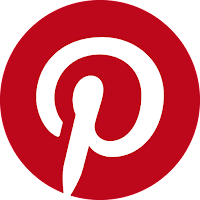 In some posts, there are usage examples, especially when relevant to "creating" ideas. Time is a great constrain in testing and writing gear reviews as well as documenting or promoting my photographic work which is not actually the point of this blog. You may see some samples in the S.C.V. Photography Ideas - Album if you like. a. Use 1 drop of blue "Loctite" on the threads of the 1/4"-20~3/8"-16 bushing before you screw on DDH-02 and tighten well. Then another drop of blue "Loctite" on the 1/4"-20 captive screw before screwing on the clamp. This will prevent the screws from loosening. for an example of Rubber Gasket which you may get from any hardware store. Keep a note that you shall need a longer 1/4"-20 captive screw in this case. c. Instead of using a bushing, you may find an M6 flat head screw 2.0-2.5 cm long and screw the DDH-02 on the top hole of the MPB150T vertical rail directly from top (as it would be attached on a ball head). You may use a drop of blue "Loctite" here too. Hello Sotiris, thank you very much for your quick response. I will try option b because I think a thin and flexible (but solid) layer between the pieces might be the solution I need, I didn't understood well what you meant with "rubber tape". But I have a doubt about the other two options: you mean "use a drop and then screw", or "use a drop, let it dry and then screw"?. Hello Fernando, you are welcome. If you Google "Rubber tape" you can see what I meant in the review. They are self adhesive tapes that come in various widths 3cm,5cm etc and 1mm, 2mm, or 3mm etc thick made of closed cell sponge rubber. My suggestion was meant for use with a camera as it offers an even and wider area. A "Rubber Gasket" or "Rubber Washer" is better for your case though. As far as "Loctite" is concerned I put a drop, then screw so it spreads in the threads, then leave for 24hrs to dry. Back to point A, thanks for explaining, it is something I have in mind to write about panoramas. I had also requests about the entrance pupil (nodal point) determination, planning the scene and discuss a little about focal lengths, depth of field etc. I thought there is a lot of information around but maybe I need to write something for reference in the blog. I just hope I have the time to do it soon. Thank you very much again, Sotiris. Hi, can I ask a question? 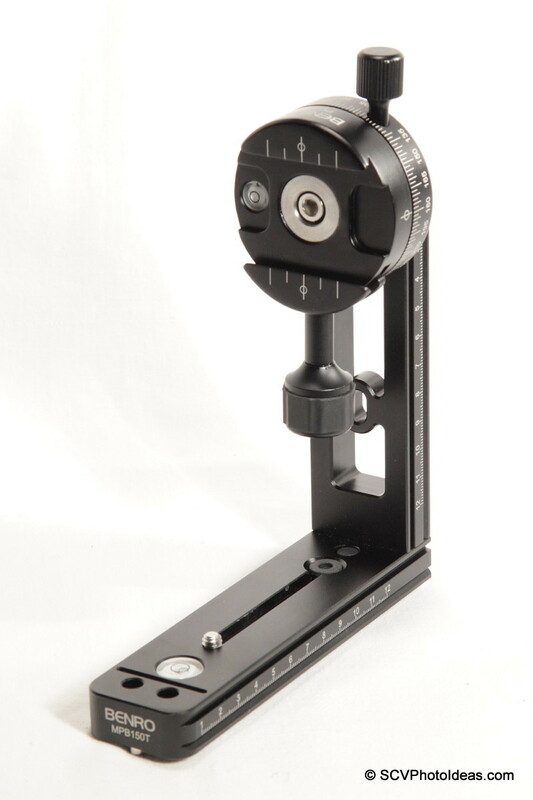 Can the sunwayphoto DDH-03 panning clamp be mounted on the vertical arm of this L bracket. I mean are the spacing of the whole identical.. Unfortunately no, it can't. The distance between the mounting holes is shorter on DDH-03. If you have a little patience, I'm in the process of finalizing an article about creating a mini multi-row pano head weighing 0,6kg (~1.3oz) total, rotators, rails, clamps all included. I expect it will be published this week, so stay tuned if you are interested. Thank you too for the kind comment. I will sure wait for your article!.. 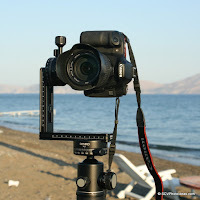 The new article titled: Create a Mini Multi-Row Panorama Head for Mirrorless Cameras is published!